General Manager of the Nevis Housing and Land Development Corporation [NHLDC] Mr. Eustace Nisbett Jr. speaking at the opening ceremony of the Cherry Garden Housing Development. NIA-CHARLESTOWN, NEVIS (January 20TH, 2011) — A four-point speech which addressed the “product, performers, promises and projections” of the Cherry Garden Housing Development kept audience members intrigued at last Friday’s [Jan. 14] official opening ceremony of the housing community. The speech, delivered by General Manager [GM] of the Nevis Housing and Land Development Corporation [NHLDC] Mr. Eustace Nisbett Jr. was punctuated with occasional references to the phrase “performance matters”: a phrase that had gone viral since the start of the New Year. 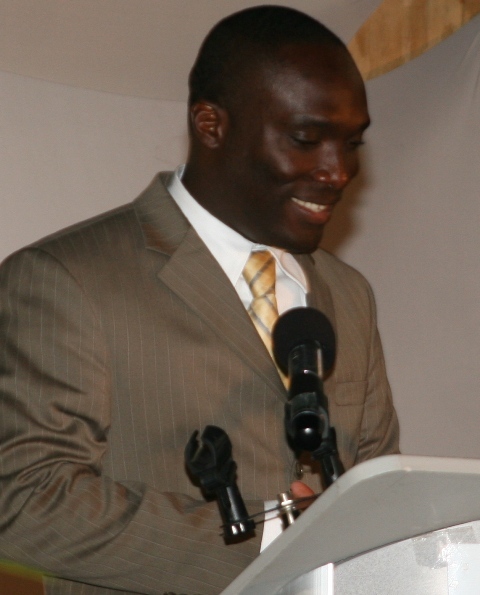 “Self, there would be times when you have to face complaints and even take some cursing but self, you cannot fail the good people of Nevis, you cannot fail the Chairman: the Honourable Robelto Hector, you cannot fail Premier Parry [and] you cannot fail the Nevis Reformation Party because performance matters,” he said. “Thank God for the sunshine as the people can see the glorious sunshine coming through the windows of the new homes that have been changed,” he said. A major attraction that formed part of “the product of Cherry Garden” was the development of its infrastructure which consists of roads, curb, electricity, water and recreational and entertainment facilities. “These are put in place, unlike other housing developments, to ensure there is some recreational and entertainment concept with it. This is constructive because it gives the residents the appropriate green space and recreational aspect that they desire. This was one of the sticking points of my Board because we could not simply and irresponsibly, like others in the darkness, provide housing with no recreational aspect. Better has come for Nevisians and we all should be proud,” GM Nisbett explained. 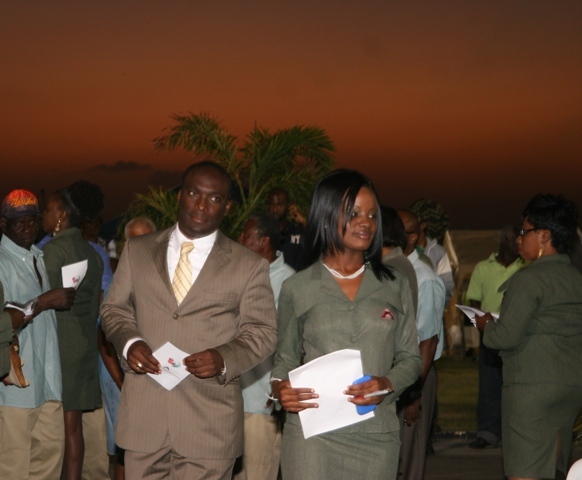 Nevis Housing and Land Development Corporation’s [NHLDC] General Manager Mr. Eustace Nisbett Jr. escorted by NHLDC employee Ms. Autric Morton. Among others categorised as “performers” were Mr. George Hunkins and Mr. Curtis Liburd of Geo Designs and Beyond Homes respectively, Surveyor Mr. Simeon Hill, Mr. Vernel Powell of the St. Kitts-Nevis Social Security Board, the Nevis Cooperative Credit Union and members of the business sector. “I have put in my two cents but those are the persons who have contributed the rest 98 cents to make this dollar,” Mr. Nisbett said. “The promise of Cherry Garden means that we are building people not projects. The promise of Cherry Garden suggests that we are changing lives not landscapes. The promise of Cherry Garden means that we are not merely engineering a development but we are trying to create a society of Nevisians who could engender the familial environment that our communities of old would be like,” he highlighted. The projected collaborative developments between the NHLDC and the NIA’s Ministry of Housing and Land, would include constructing homes in the parishes of St. Thomas’, St. Georges and St. James’ while work is expected to continue at the Harbour View Development in Craddock Road. With a large number of children now residing in the flagship Cherry Garden community, Mr. Nisbett said plans were also being made to facilitate summer sports programmes, health clinics and boy scouting activities. Phase one of the Cherry Garden Housing Development cost the [Nevis Housing and Land Development] Corporation approximately $25 million. Through its existence, 107 homes had been constructed and more than 500 persons had been employed.